A large halo engagement or anniversary ring setting composed of pave set round diamonds and ruby gem stones and milligrain edges to complete the Art-Deco design. 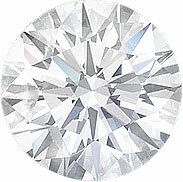 Shown with a bezel set round center diamond of approx. 2 carats. The petite pave set diamond band and the gorgeous gallery complete this beautiful ring. Can be created with other gem stones and size of center stone.